The following is a description of the physical fundamentals of flicker measurement, whereby both the mathematical and metrological applications using the BTS256-EF will be discussed. In light of the new research results in light measurement technology, flicker measurements are now highly significant, as not only low frequency signals lead to medically relevant effects, contrary to previous perception. It has been proven that flicker can cause photosensitive epilepsy, migraines, headaches, reduced performance, and stroboscopic effects, amongst others [1-9]. New developments in solid state lighting (SSL) have enabled many new applications and products in the lighting industry. For instance, light sources using LEDs with pulse width modulation (PWM) or more advanced concepts can be dimmed or can change color. All these new functions are associated with often complex electronic control concepts. These electronic components can also contain high frequency components, which may cause flicker in addition to typical low frequency oscillations. Several concepts have been developed in order to be able to examine and characterize these light sources. These include flicker frequency, flicker index and flicker percentage. As a result of these parameters, light sources can be compared with each other and optimized. This in turn results in new metrological tasks. In order to meet this demand in measurement technology, Gigahertz-Optik has developed the BTS256-EF which is exclusively designed for photometric measurements such as lux, color coordinates, color rendering index (CRI), spectra, etc. in addition to the flicker values. The following is a more detailed description of the individual flicker parameters. The specification of the flicker percentage has been shown to be highly meaningful. It indicates the magnitude (relative to the amplitude) of the waveform. The value lies between 0 and 1 or 0% and 100%, respectively. 0% signifies a pure DC waveform and 100% a pure AC waveform. 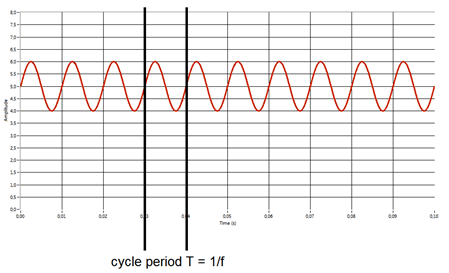 This value has no implications on the duty cycle of the signal. Besides the flicker percentage, the flicker index is also very significant. It indicates the ratio of the area under the curve to that over the curve. The center line corresponds to the average light intensity. Here, a value of 0 corresponds to a pure DC curve and 1 a pure AC curve. 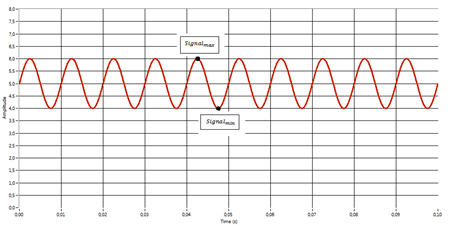 This factor specifies the duty cycle of the signal. The BTS256-EF is primarily a spectral but also integrating luxmeter. This is made possible by the BiTec sensor developed by Gigahertz-Optik. 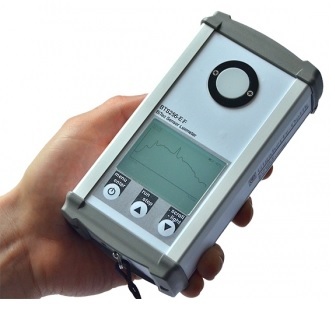 Figure 4: BTS256-EF, a spectral but also integrating luxmeter designed for mobile use. One of the characteristic features of the device is its compact size, which makes it ideal for mobile use. The fact that it is splashproof also makes it well-suited for outdoor applications. A large memory is integrated, from which the S-BTS256 software can be read out. The device also has a user-friendly interface due to the numerous incorporated display options, some of which are customizable by the user. The well-matched cosinusoidal diffuser with a traceable calibration by national standards guarantees the precision of the measuring device, which can optionally be delivered with an integrated WiFi module. Figure 6: Example of a flicker measurement with three frequency components. 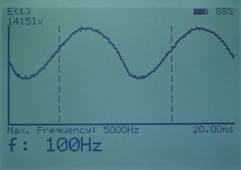 The frequency is shown on the left column and the percentile component in the signal displayed on the right. Figure 7: Graphical display of the light signal. The calculated period is shown between two perpendicular dotted lines. A few points should be noted when it comes to measurement accuracy. Basically, the signal to be measured should be strong enough (e.g. at least 100lx are recommended by a max. frequency of 5000Hz). Only then is it possible to guarantee a good signal to noise ratio for the flicker measurement. Figure 8 shows an example of a signal with a bad signal to noise ratio for the flicker measurement. The difference becomes obvious when figure 8 is compared with figure 7. This results in a decrease of the calculation accuracy of both the frequency and flicker parameters. How pronounced this effect is depends on the amplitude of the flicker signal, a large amplitude might be detectable even by the presence of noise. However, small flicker signals can be below the noise level and are thereby cannot be detectable. As a guideline the amplitude of the noise should be significantly smaller than the amplitude of the flicker signal. 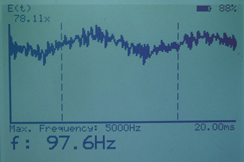 Figure 8: EA 178.11lx signal means a bad signal to noise ratio. The error in the calculation of the frequency and flicker parameters thereby increases greatly. Furthermore, the diode measurement time (Menu Diode Settings ? Measure Time) should be matched to the signal to be measured. Figure 9: Setup of the measurement time from the BTS256-EF device menu. This means that when the expected frequencies are very high, the shortest time constant of the diode (i.e. 50 ms) should be selected. 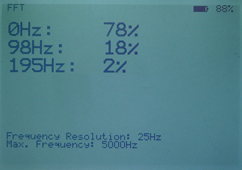 The resulting maximum frequency is shown on the corresponding display (see Figure 7 with 5000 Hz). Very low frequency signals on the other hand require a much longer time constant (see Figure 9 with 1000 ms). The frequency resolution is hereby much better, but the maximum frequency to be determined consequently decreases. 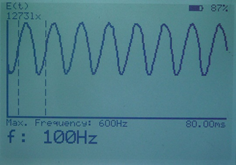 Figure 10: Display of a low frequency signal: Here, the maximum frequency to be determined for this signal strength is 600 Hz. These measurement time configurations result in changes in the entire measurement time of the BTS256-EF. It is therefore recommendable to set the diode to the default 50 ms if the flicker function is not being used in order to shorten the entire measurement time of the device. Several measurement parameters have proven to be important when it comes to evaluation of light sources with regards to flicker. 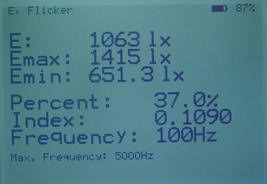 These include the flicker frequency, flicker index and the flicker percentage. All these factors can be directly measured using the BTS256-EF. The device f enables analysis of different frequency components based on their weighting in the light signal using the integrated FFT (Fast Fourier Transform) analysis function. This is of particular interest when different frequencies or a dominant frequency together with high-frequency components are superimposed. The BTS256-EF is designed for the detection of flicker frequencies up to 5 kHz. Parallel to the flicker parameters, the BTS256-EF also calculates all the relevant photometric data such as light intensity, color coordinates (x, y, u´, v´), color rendering index etc. In addition, the BTS256-EF stands out through its compact and splash-proof design, properties which make it excellent for mobile use where flicker examination should be carried out on-site e.g. for example at a workstation. Bullough, J.D., Sweater Hickcox, K., Klein, T.R., Lok, A., and Narendran, N., 2011. Detection and acceptability of stroboscopic effects from flicker, Lighting Research and Technology 0: 1-7. Bullough, J.D., Skinner, N.P., and Sweater Hickcox, K. 2012. Visual performance and perceived lighting quality under flickering illumination, Proceedings of the 13th International Symposium on the Science and Technology of Lighting, June 24-29, 2012, Troy NY, pp. 375-376. Fenton, D.M. and Penney, R. 1985. “The effects of fluorescent and incandescent lighting on the repetitive behaviours of autistic and intellectually handicapped children,” Journal of Intellectual & Developmental Disability, vol. 11, no. 3, p. 137–141. Fisher, R.S., Harding, G., Erba, G., Barkley, G.L., and Wilkins, A.J. 2005. “Photic-and Pattern-induced Seizures: Expert Consensus of the Epilepsy Foundation of America Working Group,” Epilepsia, vol. 46, no. 9, pp. 1426-1441. IES RP-7: Recommended Practice for Lighting Industrial Facilities, 2001. Illuminating Engineering Society, New York, New York. Rea, M.S., The IESNA Lighting Handbook, 9th Edition, 2000. Illuminating Engineering Society, New York, New York. Veitch, J.A. and McColl, S.L., 1995. “Modulation of fluorescent light: Flicker rate and light source effects on visual performance and visual comfort,” Lighting Research and Technology: 27, no. 4, p. 243. Vogels, I., Sekulovski, D., and Perz, M. (Est. 2011). Visible Artefacts of LEDs. Philips Lighting, Eindhoven, Netherlands. Wilkins, A.J., Nimmo-Smith, I.M., Slater, A. and Bedocs, L., 1989. Fluorescent lighting, headaches and eyestrain. Lighting Research and Technology 21: 11-18. Wilkins, A.J. and Roberts J.E., 2013. Flicker can be perceived during saccades at frequencies in excess of 1kHz. Lighting Research and Technology 45: 124-132.